What I like most about fusion is the raucous energy it creates. Most players involved in the genre have a rock background that lends itself to some pretty grooving and cutting-edge jazz ideas when marrying the two genres together. Enter Brian Hudson, a drummer with a multi-principled background in music, hence proving my point. Hudson grew up in Clearwater, Florida and started playing drums at the age of ten. In high school, Hudson studied privately with Jason Harnell (Maynard Ferguson), played in the drum line, the stage band and with a local band. After high school, he attended The University of South Florida School of Music for a year and a half, where he divided his playing between jazz combos, the symphony orchestra and playing with local jazz musicians around Tampa. He later transferred to the University of Georgia and the music town of Athens, Georgia to finish college, which provided him a rich diversity of music opportunities. For the past seventeen years Hudson has performed, live and in the studio as a band member, or as a sideman with various artists covering a wide range of music. He is a member of former Capricorn Record Artist Memory Dean, soul/funk band Soulhound and performs with various other artists covering a diverse mix of music. 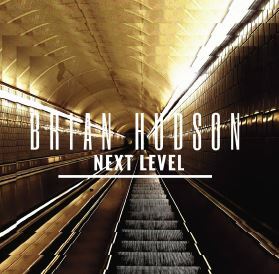 Next Level is Hudson’s debut album in the fusion jazz genre, to me it’s just called fusion, but to some in the jazz genre, they insist on the specificity. Ok, so moving on now, the album was co-produced by veteran jazz pianist Randy Hoexter, so the jazz pedigree is clear. What Next Level offers beyond is smart, grooving, yet intelligent ideas. Complex harmony, yet at the same time deceivingly accessible. The writing is strong on this album. So, what about the playing? Well here are some clear reasons why this album stood out for me. Starting with “NYC,” the melody is energetic and full of subtle band hits and counterpoint. Hudson’s kit fills the space with a powerful sound that pushes the music, while still allowing space for melodic lines to live and breathe. As the tune unfolds, the compositional elements come into focus, with refined reharmonizations, rich voicings and savvy bits of counterpoint and full backgrounds, Hudson creates a musical statement that is moving in both its musical prowess and its emotional stimulation. Skelton’s soloing is engaging and full of fiery exchanges with Hudson’s rhythmic commentary aflame. The decisive “Ybor City,” contains gorgeous harmonic movement and melodic relationships set to a medium up funky fusion beat, with a poignant and lyrical melody. All are certifiable killer soloists as they ably demonstrate on this track, which Hoexter, Skelton, Adam Nitti and Hudson air time to demonstrate their formidable skills. Hudson’s cymbal work is exceptional as this track demonstrates, always interactive and full of rhythmic creativity. Using a portion of the intro for his drum solo on this track, Hudson again shows how he is always concerned about making an flowing musical statements that are cohesive and uniform in presentation and flow.